I take pie seriously. 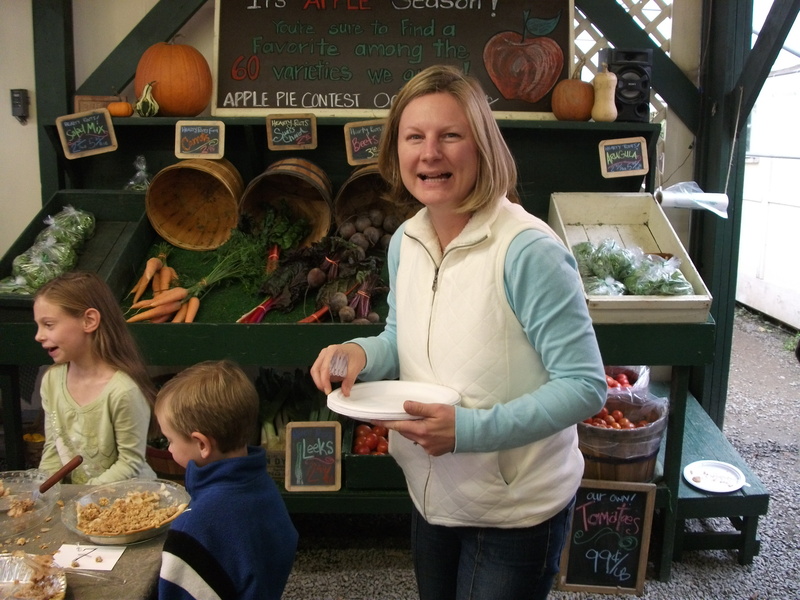 For the last two years, I baked my best for Montgomery Place Orchard Farm Market’s annual antique apple pie contest held in mid-October. It’s always great fun …and nearly impossible to predict the winners. In 2009, I won a red ribbon for my apple pie filling. Last year, nada (even though I entered the exact same pie! )… More on my travails as a contestant in my Rural Intelligence article here. Ahhhh, karma is sweet: this year, I was asked to be a judge. 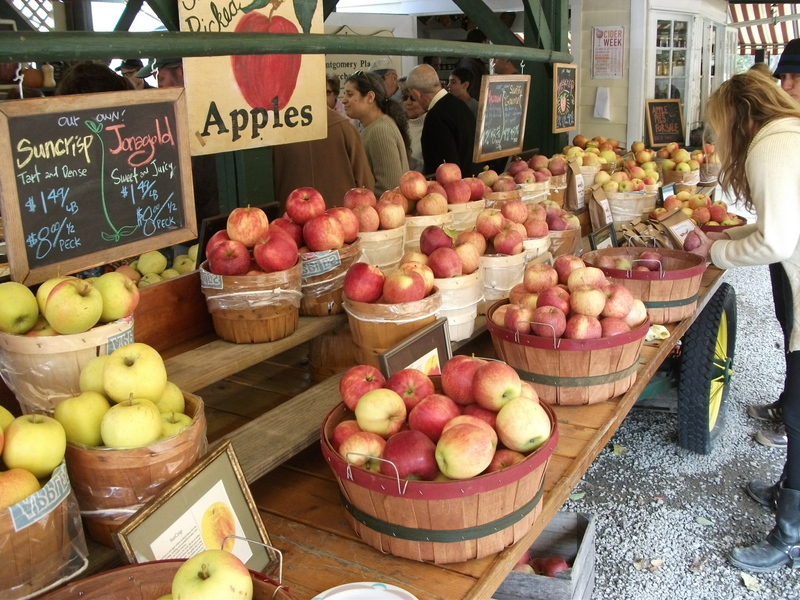 Located on Route 9G and Rt 199 in Annandale-on-Hudson, Montgomery Place Orchards farm stand holds a special place in the heart of many of its loyal customers, including me. It has everything to do with Doug and Talea Fincke, dedicated small farmers who have been growing fruit—and now produce—on 40 acres at the historic Montgomery Place estate for 25 years. Son, Adam, and daughter, Caroline, pitch in, too, making it a truly family-run farm. The Finckes grow 60 kinds of apples. 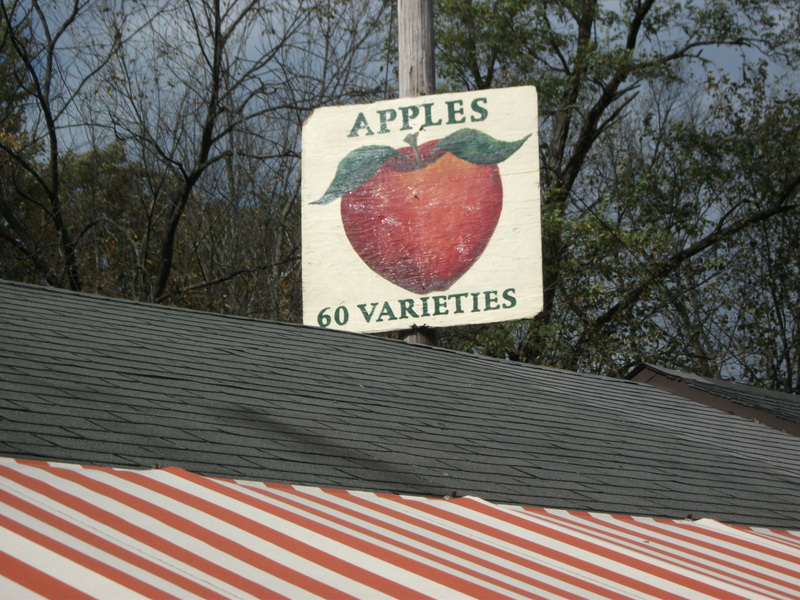 But they are especially famous for their antique apples—heritage varieties that are obscure or non-commercial—like Northern Spy, Swiss Gourmet and Esopus Spitzenberg. Just don’t come here looking for Red Delicious! 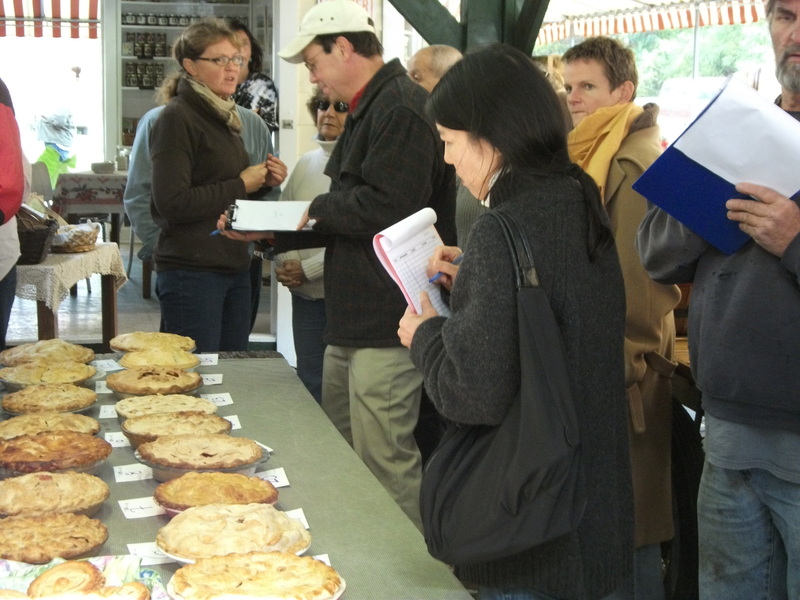 The pie contest began in 2004 as a way to encourage customers to learn about antique apples and which ones are best for pie. When you sign up, you receive a free, half-peck of antique apples (your choice)—usually enough for two apple pies—for the contest. This year, the competition was fierce. I was surprised by the number of entries: 16 in the crumb crust category. And 26 pies in the double crust category! A merry crush of kids, contestants and curious onlookers packed the stand. 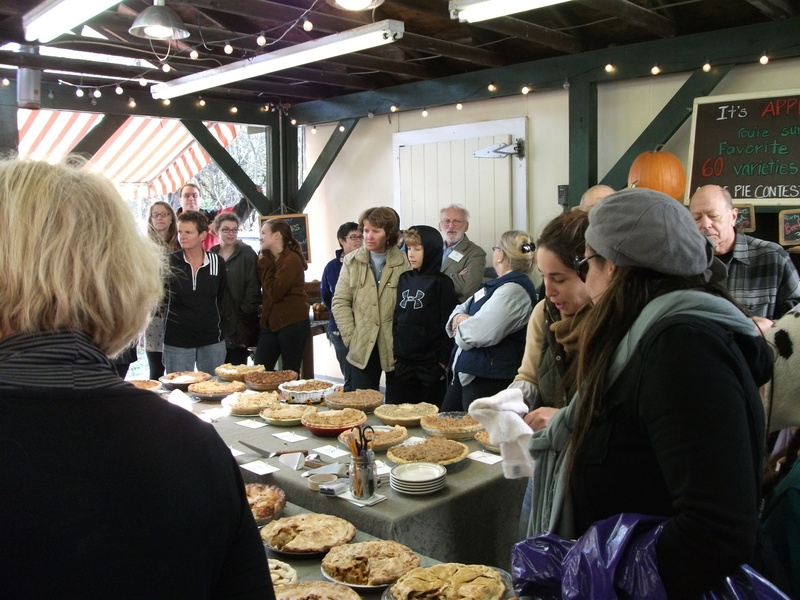 I spotted Annie Lebowitz in the crowd…turns out, her daughter had entered a double-crust pie. The panel of judges changes every year. Talea recruits judges based on a specific theme. Past panels have included chefs, pastry chefs, local farmers, grandmothers, Titans (men over 300 pounds) and lawyers. This year, I was honored to be counted among a panel of six judges who “Help Keep Montgomery Place Farm Stand Running”, a group that ranged from the Finckes’ refrigeration repair man Jim Marsh, to their loan officer, Dave Rifenburgh and bank representative Mary Lou Byrnes. 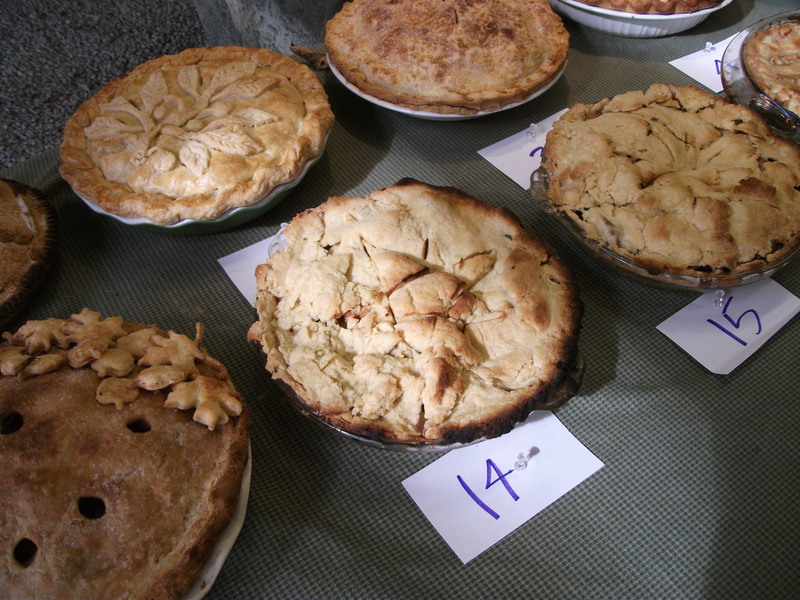 Judges rated the pies on a scale of “1” to “10” (“10” being the best) in three individual categories: overall appearance; crust; and the filling. The contestant with the highest total score wins. I was judging the double crust pies, along with Mike Fargione, a fruit specialist from the Cornell Cooperative Extension and Ron Dressel, the Finckes’ equipment specialist. We were a disparate trio, but we were all veteran apple pie bakers who favored similar things in our apple pie: apples on the tart side; a not-too-sweet filling; balanced flavors and a baked-through crust, neither too hard nor too soft. An apple variety that’s on the slightly tart side. Not too sweet. Easy on the spices. The texture of the filling should not be applesauce-mushy, nor should the apples be so firm that they taste nearly raw. Nix goopy additives….and, by “goopy”, I mean cream cheese or cheese of any kind for that matter. Too much spice, sweetness, lemon or cheese distracts from the star ingredient: the apples. Which, for me, is the whole point of apple pie. Keep it simple and you can’t go wrong. I like a simple, rustic pie crust. Made with all-natural butter. The crust should be baked all the way through, evenly browned on the top and bottom—not burnt around the edges (or anywhere else). I’m not a fan of doodads, like decorative sugar crystals or anything “sprinkled” onto the crust. Yes, I understand it creates a glittery effect and adds crunchy texture; I just don’t think decorative sprinkles have a rightful place on apple pie. Personally, I don’t use shortening when making pie crust because of the trans fats in vegetable shortening; also, it tends to yield a whitish-looking crust (a big turn-off for me). In terms of texture, I’m not a fan of “flaky” crusts. Nope. IMO, “flaky” is a term reserved for the likes of phyllo-wrapped spinach pie. Not apple pie. I like a firm, but easy-to-fork-through crust. An even golden-brown pie crust. No burnt edges. An even filling distribution: the filling shouldn’t be jutting out like the Himalayas in the middle of the pie, or oozing out the edges either. Points off for any “tenting”, where a Grand Canyon-sized gap of dead air lies between a high crust and a bottom-hugging filling. As previous judges have noted: a good-looking pie isn’t necessarily a good-tasting one! I couldn’t agree more. Looks aren’t everything, but it’s an important slice of the pie (pun intended) here! This year’s double-crust winner? Apparently my fellow judges and I were on the same page. It was the second double-crust pie we tasted…..from veteran baker Mary Creech in Tivoli. She wooed us with a pie that not only looked beautiful: it tasted delicious. For me it was a winner because it met all the criteria above. And the apples varieties she used for her filling? Swiss Gourmet and MacCoun. Congratulations, Mary for a knock-out effort! 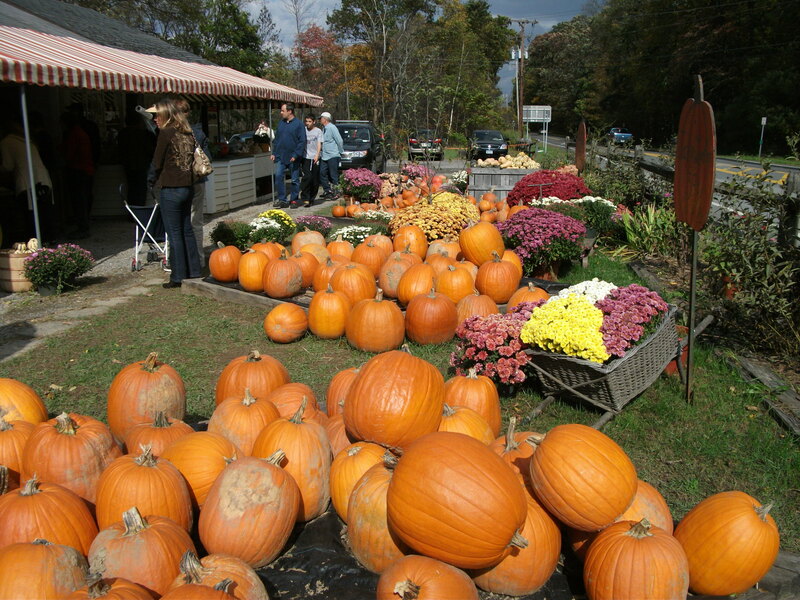 This entry was posted in Farm Stands, Food, Home Baking, Hudson Valley, Local Food and tagged antique apples, apple pie, apple pie contest, Montgomery Place Orchard Farm Market. Bookmark the permalink.